If you could invest in a solution that would help you to run your company more efficiently, make better decisions, and understand your customers better, would you make the investment? What if you could get all those answers and have less stress and increased revenue, too? Sounds amazing right? Maybe even too good to be true? It’s actually not. Making an investment in business intelligence can result in all of this. And the ROI will actually shock you. And yet, there are business owners who still ask us if BI is worth the investment. So, if you’re asking the same question, rather than tell you, “Yes, it is,” we’re going to show you how it’s worth the investment through real-life examples of how business intelligence has significantly improved business processes and bottom lines for a variety of businesses. Here are 7 real-life examples of how business intelligence can transform a business. You can’t deny the need for BI after reading these case studies. Our client, a key player in the retail business, was dealing with erratic sales performance with most reps not meeting targets consistently. Their strategies were driven by guts instead of data, and they were faced with dwindling sales rep morale. The sales director wanted to correct this course by attaining a granular level of understanding of the sales process and performance. The Opportunity: Come up with a data-driven strategy to streamline their sales process. Understand and organize the pipeline, so reps could prioritize time spent on each type of prospect based on both the probability and the dollar value of the conversion. Measure and monitor sales rep performance in terms of the value of business they brought in. Empower sales reps with data. Using data and business intelligence, RTS Labs was able to help sales grow by 24% and rep attrition drop by 90%. Due to a better organized target-setting process and refined sales strategies backed by data, the reps were not only meeting but surpassing their targets. Our client’s Clinical Trials department was faced with a laborious data management process. Their studies depended on collecting clinical information from their internal lab information system as well as from external sites. The problem was that the process was negatively impacting the quality of the data and productivity. 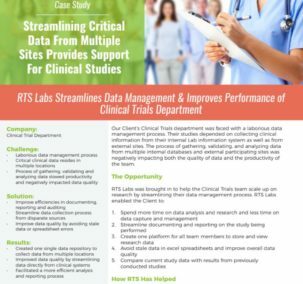 The Opportunity: RTS Labs was brought in to help the Clinical Trials team scale up on research by streamlining their data management process. Institute OpenClinica for collecting data from participating practices and physicians. Built a datamart to combine data from both their internal lab information system and OpenClinica. By streamlining the data gathering, data management, and analysis processes, RTS enabled the Clinical Trials team to scale their research without having to scale their resources. Our client, a fast-growing company in the bio-sciences industry, wanted to develop a data-driven marketing plan for the coming year. While the strategy was designed to increase market share, the company lacked the processes and systems necessary to capture and analyze the customer insights that were needed. They had no way of ranking their customers on key parameters for specific targeting. They had no way of tracking the impact of their marketing events. Their data was not integrated. RTS implemented a unified BI platform, integrating multiple data sources into a single datamart. From there, we calculated the specific marketing metrics needed and segmented their data for future campaigns. The result was lower marketing expenses, higher sales and a better bottom line. What do you do when you have multiple databases and workflows to manage, your cashflow is off, and your customers are asking for access you can’t give? You call on a BI superhero to save the day. This particular business was managing accounts receivables for their customers via third-party payment agents. In addition to managing client data, they were struggling to manage their own back office data with no cross-system visibility or streamlined reporting. The Opportunity: Their operations could be streamlined drastically if only the data from their multiple systems could be aggregated and one set of reports could be derived from that aggregate data. Provide the client’s customers with the requested insights into their data. Boost the client’s operational efficiency. RTS Labs did a complete data integration, set up a datamart to drive reporting, and used embedded business intelligence to provide insights into customer data. As a result, customer retention was solidified, if not increased, and customer service costs were reduced. Our client, a disease diagnostics company, was in its early phase of aggressive growth. While new clients were being acquired and new partnerships were being forged rapidly, a pile of claim denials and receivables were accumulating in the background. With little insight into the nature of these denials and payment delays, their percentage collections were low and accounts receivables had hit an all-time high. The Solution: RTS Labs created a datamart and reporting system that allowed us to analyze the data. We were able to uncover a trend of denials that was associated with a certain insurance payer that happened to be the largest payer group in those regions. As a result, “Days in AR” was reduced by 30% in two months, and $8 million worth of claims was recovered. Our client, an online retail firm, had amassed a large amount of customer activity and transaction data on their eCommerce platform. But having the data is only the first step. They needed a way to organize and analyze that data, so they could better understand the impact of their marketing activities. They also needed it done affordably. The Solution: With our affordable and comprehensive BI toolkit, we segmented their buyers based on a variety of factors, refined a target list of customers to whom they should approach with email offers, and determined the email perfect frequency. The result was a decreased number of emails marked as spam, a three-fold surge in response to marketing initiatives, a 30% reduction in customer churn rates, and a 60% reduction in marketing costs. As a fast-growing healthcare business in the US, our client was faced with the challenge of having large amounts of data located in disparate sources. The isolated databases had no cross compatibility, preventing our client from utilizing this data when making key business decisions. The Solution: RTS Labs implemented a unified business intelligence system, integrating multiple data sources into a single platform, and created high-value reports that provided multi-dimensional analysis. The result was an increase in productivity across the board; billing, marketing, sales, and finance departments were armed with the tools they needed to perform their jobs more efficiently. By helping the right people to make sense of fragmented data, these reporting insights fundamentally steered the company towards a direction of well-managed expansion. Arthur C. Nielsen, the founder of The Nielsen Company, once said, “The price of light is less than the cost of darkness.” We love taking clients out of the darkness and into the light by empowering their teams with data. As you can see from these seven examples, the investment in business intelligence is worth it. All you need is the right partner. Do you have a technology solution that could disrupt your industry? Let’s chat! We can help you refine your business plan, target the right market segments, and build raving fans who take you where you need to be.